Dean Skelos and son, Adam, arrive separately to federal court in New York last week. Former Senate Majority Leader Dean Skelos, and his son Adam were found guilty of federal corruption charges in a retrial that ended Tuesday. Dean and Adam Skelos had been convicted in 2015 of crimes that included the elder Skelos arranging no show jobs worth $300,000 for his son. But the conviction was overturned on appeal. 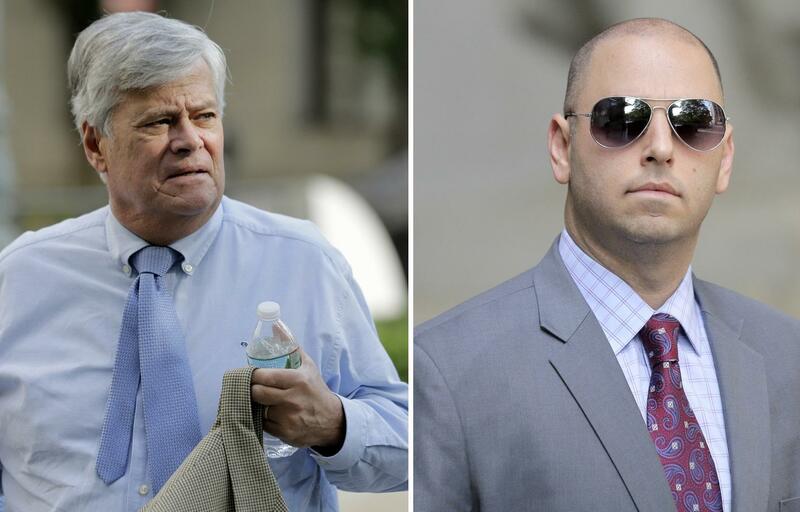 In the retrial, a jury for the second time found both Skelos guilty on all counts. In the second trial, Dean Skelos took the stand and testified that he did help get his son jobs, but said it wasn’t in exchange for political favors. In the end, the jury didn’t buy his version, and instead agreed with the prosecution that the job payments to Adam were actually bribes. The conviction comes two months after former Assembly Speaker Sheldon Silver was found guilty, for the second time, of using his official position to illegally gain nearly $4 million for his personal use. Silver’s first conviction was also thrown out on appeal. And it comes less than a week after the former architect of Governor Cuomo’s economic development programs, Alain Kaloyeros, was convicted on bid rigging charges, along with three upstate developers. In March, Cuomo’s former closest aide was convicted of bribery.